The 17th annual Student Research and Creativity Celebration will take place Friday, May 1, and Saturday, May 2. 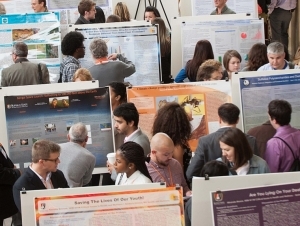 One of Buffalo State’s great traditions, the Student Research and Creativity Celebration allows undergraduate and graduate students in all academic disciplines to present their preliminary and completed research and creative activities in a student-friendly, supportive environment. This year’s celebration includes 378 presentations, performances, and art exhibitions that feature the work of more than 450 Buffalo State students. Over 125 faculty members are serving as mentors. That level of participation is an all-time record for the program (so far)! “The students presenting at this celebration have gained an appreciation of the research process, overcoming myriad challenges, and the confidence that they can make meaningful contributions to their discipline, while developing skills that will serve them well as they embark upon graduate school and throughout their professional careers.” said Jill Singer, professor of earth sciences and science education and director of undergraduate research. President Conway-Turner and Provost Ponton will host an opening reception from 5:00 to 6:30 p.m. Friday in the E. H. Butler Library lobby. Research papers and poster sessions will be presented Saturday from 8:30 a.m. to 5:00 p.m. in the library, while performances and artistic events will take place in the library, in the Donald Savage Theater and Communication Building's Flexible Theatre, and in Upton Hall’s Warren Enters Theatre. Oral presentations will be divided by academic groupings into seven sessions throughout the day. Eight hour-long poster sessions, each with a diverse representation of disciplines, will take place concurrently with the oral presentations. Recipients of fellowships awarded last year in the 16th round of the Undergraduate Summer Research Program also will be presenting their research.